The Scottish poet and novelist John Burnside was born in 1955 in Dunfermline, Fife. 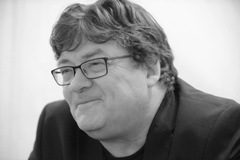 Burnside studied English and European thought and literature at the College of Arts and Technology in Cambridge, and worked as a computer engineer before becoming a freelance writer in 1996. His first volume of poetry »The Hoop« (1988) won the Scottish Arts Council Book Award. His debut novel »The Dumb House« (1997) is about a man’s obsession with determining »the locus of the soul. He experiments on his own children, locking them up in the basement to isolate them from all outside influence. »The Mercy Boys« (1999) tells of four young men from Dundee, who meet in a pub every day and drink to the point of becoming comatose – until one of them finally commits an act of unfathomable violence. »Glister« (2008) is set in a radioactively contaminated post-industrial coastal town, whose inhabitants have resigned themselves to the disappearance and presumed murder of local boys, in the belief that they have gone on to a better place. Burnside explores childhood and drug experiences in his memoir »A Lie About My Father« (2006): the protagonist grows up in a socially vulnerable family, dominated by a physically ruthless, alcoholic hard-man of a father, and finally develops substance abuse problems of his own. The novel portrays what it means to be at the mercy of one’s parents while growing up, and the intractability of family relationships. »A Summer of Drowning« (2011) begins on a Norwegian island inside the Arctic Circle. Like »Glister«, the novel begins with the disappearance of two boys. In her attempt to clarify events, their classmate, the daughter of a painter who sees spirits, becomes increasingly caught up in Norwegian mythology. Burnside manages to reveal the mystery of phenomena through seemingly insignificant snapshots. In »Waking Up in Toytown« (2010) Burnside returns to father-son relationships: after years of self-deceit, the author acknowledges that he has followed in his abhorrent father’s footsteps, living a life governed by drugs and alcohol, lies and complete irresponsibility, and details how he created a life of normalcy for himself. Burnside is a professor at St. Andrews University, where he teaches creative writing, literature and ecology, and was elected a fellow of the Royal Society of Edinburgh in 2016. »Black Cat Bone« won the T. S. Eliot Prize in 2011, and in 2012 he was awarded the Spycher: Literaturpreis Leuk. He lives in Fife.